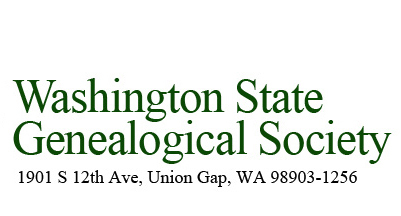 Welcome to the Washington State Genealogical Society's website. We are here to help connect you with resources and services so you can advance your search for your Washington State ancestors and family history. Nestled in the beautiful northwest corner of the U.S., Washington is a state with terrain from the vast Pacific Ocean, snow-capped Cascade Mountains and forested islands in Puget Sound to rolling wheat fields and an abundance of apples, pears, grapes and hops in Eastern Washington. While Seattle is Washington’s most recognized city, known for its booming tech industry, vibrant music scene and famed coffeehouses, the center of state government is in Olympia. State landmarks include Mt. Rainier, Mt. St. Helens, the Space Needle, and mighty Columbia River. Washington became a state in November 1889 as the nation’s 42nd state and is the only state named after a U.S. President. 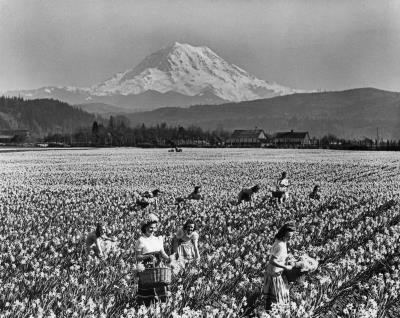 Daffodil field, Mount Rainier, and flower pickers, 1950s, Lee Merrill, General Subjects Photograph Collection, 1845-2005, Washington State Archives, Digital Archives, http://www.digitalarchives.wa.gov, [accessed 13 April 2019]. For upcoming genealogical society meetings, seminars/workshops, or special events, check out the WSGS Meetings and Events page. If you know of other happenings, please email details to webmanager@wasgs.org. Blog: ​Sign up for our blog to keep current with the latest genealogical happenings and events in Washington State and the Pacific Northwest. Cemetery Project: A comprehensive list of current and abandoned cemeteries is available here. Event Calendar: Looking for a road trip? There are genealogical events and meetings all around the state, as well as neighboring states and British Columbia. Local Society contacts: There are more than 30 local genealogical societies around the state waiting to help you in your research. 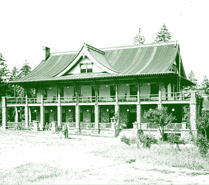 Pioneer and First Citizen Program: Begun in 1989 to celebrate Washington's centennial, the Pioneer and First Citizen Program memorializes those Washington citizens who were early residents of the state. Commemorative certificates are available upon residency proof, as well as an index of participants. Resource Guides: Looking for resources in a specific county? Check out these comprehensive resource guides listing everything from chambers of commerce, and local government departments to libraries, churches and newspapers. Speakers' Bureau: If you're looking for a speaker for a society meeting, workshop or seminar, visit our Speakers' Bureau page. Support to Local Societies: The WSGS is here to support local genealogical societies. We offer financial grants for innovative projects, education assistance and special recognition for local members and projects. The Tacoma-Pierce County Genealogical Society is pleased to host Michael Lacopo as the featured speaker for their 2019 Spring Seminar. More details to come. Tony Burroughs, an expert in research strategies and methodology and African American research, will be the keynote speaker at the Forum of Oregon's Spring Seminar in 2019. For more information, visit the GFO website.